Will Bicycle Race Expand to Bay View? 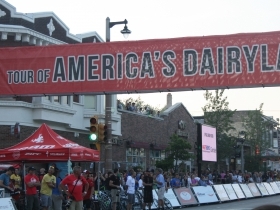 Tour of America's Dairyland hopes to expand there. And a national benefits program for bicyclists expands to Milwaukee. Could Bay View be the next stop on the Tour of American’s Dairyland? Photo by Dave Reid from the 2012 Downer Classic. The 7th Tour of America’s Dairyland is hoping to add a Bay View stage to its 2015 schedule, organizers tell Urban Milwaukee. But difficulties coordinating street closings and transit rerouting still need to be solved, they note. 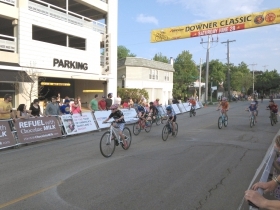 A Bay View stop at the race, which runs from June 18th to June 28th, would be a boon to the neighborhood, if the results of the hugely popular Downer Classic are any indication. For that event, hundreds line the route, which passes by some of the magnificent houses of the East Side, while Lake Drive residents hold open house cookouts. The route is said to be among the national favorites of elite cyclists, due to its beauty and enthusiastic crowds. The Cafe Hollander, 2608 N. Downer Ave., does a magnificent business as the race headquarters. A likely Bay View counterpart would be the Lowland Group’s sister restaurant, Cafe Centraal, located at 2306 S. Kinnickinnic Ave. 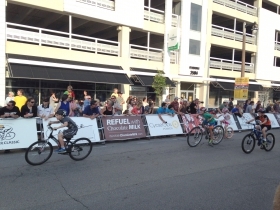 The 2014 Tour of America’s Dairyland, sponsored by the Wisconsin Milk Marketing Board, drew over 6,200 starters to its sanctioned events, held over the course of 11 days throughout Wisconsin. 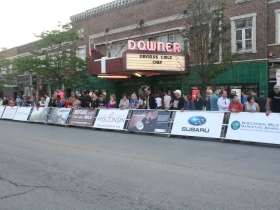 Over $150,000 in cash prizes were awarded, with $11,000 alone at the Downer Classic. 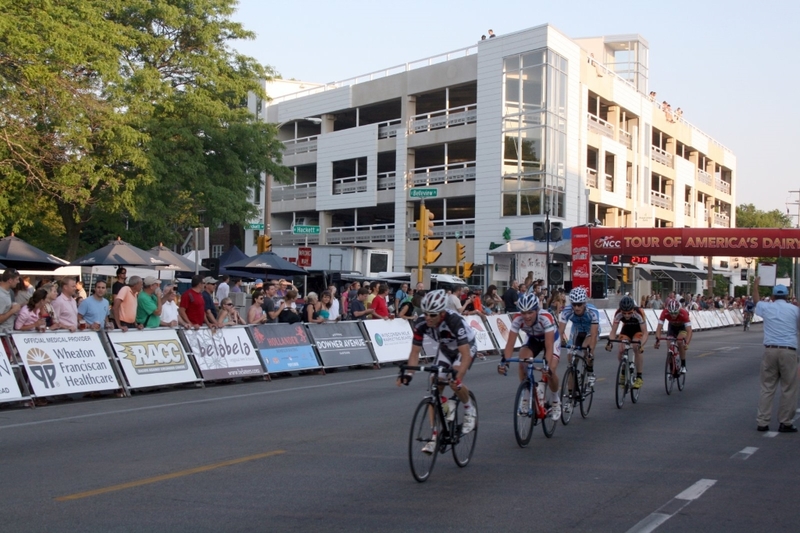 Other local events in the 2014 round included the Shorewood Criterium Cycling Classic, the Schlitz Park Criterium, the Downer race, and the East Tosa Grand Prix. Registration will be available on-line later this month. You can follow the Tour on their website, on Facebook, or on Twitter. Speaking of bicycle races, The Milwaukee Messenger Invitational XIV will take off from the clubhouse of Breakaway Bicycle Couriers, 224A W. Wells St., on Saturday, March 14th. This event, traditionally the first bicycle race of the season, takes place this year on “Pi Day,” which celebrates the mathematical constant (3, 1 and 4 are the first digits of “Pi” so the day falls on March 14). As a race, the MMI is as different from the Tour of America’s Dairyland as that number with infinite digits is from an easily divisible even number. 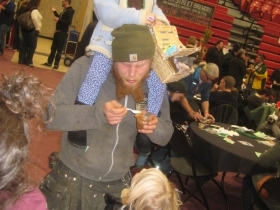 Whereas the Dairyland races are sanctioned events with a definite itinerary and route, the Messenger Invitational is an “alleycat race,” where none of the participants knows where they are going, or what they are going to be doing until they open their manifests just moments before the race begins. It is a quintessential urban event that would be utterly inconceivable in a suburban environment. Even Shorewood would be stretching it. Typically, the manifests will outline a series of complicated pickups and dropoffs that mimic the day-to-day work of bicycle messengers as they go on their rounds. These pickups and dropoffs are monitored at various checkpoints, which sometimes include an extracurricular event, like downing a shot or a beer, or performing a feat of strength or bicycle endurance. Sometimes riders are expected to note numbers posted on the rear of traffic signs, find obscure details on prominent buildings, or perform other tasks. “You will need your bag for this race,” the organizers warn, giving us a hint that there will be cargo to carry as well. The participants include members of Milwaukee’s fluid messenger community, as well as some of those who have moved to other places. The event routinely draws messengers from Chicago, Minneapolis and beyond. Already the message boards are filled with requests for bunk space throughout the civilized portions of the community. There won’t be an empty sofa in Riverwest the whole weekend, you can be sure. Among expected participants is Steven Feih and others from Milwaukee Courier Company. 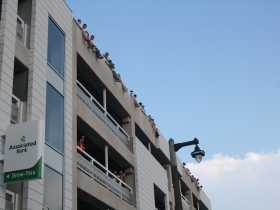 The messenger service, established in April 2009, recently relocated from the Blatz building to new quarters above Jim’s Time Out, 746 N. James Lovell Dr.
For the second year in a row, the race will share the streets with the annual St. Patrick’s Day Parade. Both kick off at noon, with the routes somewhat intersecting here and there, adding to the fun and the unpredictability. Event sponsors include Fyxation, Great Lakes Distillery, Dank Bags, Ben’s Cycle, Trash Bags, Potbelly Subs and — of course — Pabst Blue Ribbon Beer. Travelers Cohl Wiesbrook-Peterik and Evan Pack are back in Milwaukee after a two-and-a-half month bicycle journey through Mexico, fit and tan as might be expected. The only setback was a minor stabbing Pack endured during a feeble robbery attempt by a kid, who ran when he saw Cohl approaching — and who could blame the young thief? The two are back at work at Vulture Space Bicycle Cooperative, which had been left in the capable hands of New York native Ian Klepatar, founder and missionary of “Bicycle Benefits,” a national discount program started some years ago which he has recently introduced here. “The intent is multifaceted … to reward regular bike riders with a reward for pedaling. Often times in the private sector, drivers get the breaks…drive thrus, Gas Rewards at many larger grocery stores, FREE parking, subsidized by all shoppers. In the public sector, it’s less visible but everywhere…the bike riders are the most vulnerable road users, situated in a space between parked and moving cars, take in the most exhaust, and get the dirtiest, get the most flat tires from car litter etc. and for the past 100 years have been told to coincidentally ‘get off the sidewalk’ and ‘get off the road,'” he notes. 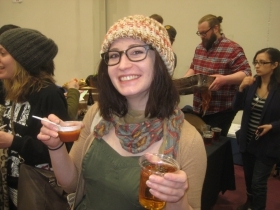 March came in like a Lion for the tastebuds of those who enjoyed the Rockabilly Chili Fundraiser held Sunday at the MSOE Kern Center, most particularly those who tasted the winning entry in the “Hot” category from McBob’s, the west side tavern and restaurant. 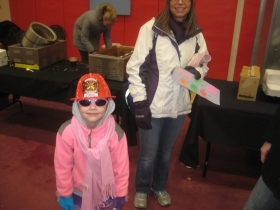 The event, the year’s largest fundraiser for radio station WMSE [91.7 FM], brought in over 4,000 attendees and $60,000 in donations to the station, according to WMSE Promotions Director Sidney McCain. That’s a 10 percent increase, “which may not sound like much, but it is huge!,” she exclaimed in a telephone interview from the station’s studios, located on the downtown campus of the Milwaukee School of Engineering. The event occupied the entire Kern Center, the athletic facility of the school. 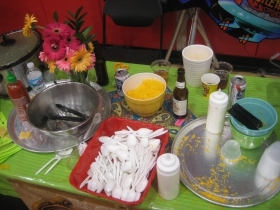 Artists Working in Education once again provided an activity area for young people, and indeed the presence of hundreds of little ones brightened the winter day, while the chili warmed the tummies. It is indeed encouraging to know that these children will go home to environments where they will be able to hear the tremendous diversity of music broadcast on the station, and not have to suffer through incessant AM Talk Radio rants. 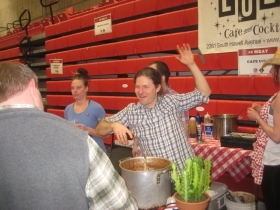 Over 50 restaurants pitted their chili recipes against others in six categories. 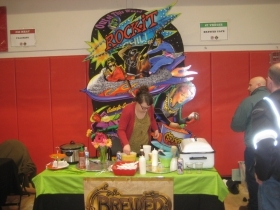 Best Display and Best Meat Chili goes to Water Street Brewery. 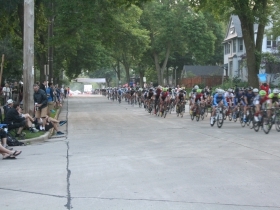 A bike race in Bay View should be a no-brainer. There was one on KK 3 or 4 years ago put on by the International Cycling Classic guys (now no more). Since the businesses would gain the most, the Bay View Bid and the Alderman should work together to make sure this happens. They should run the Bay View race on KK, Lincoln, Lenox and Potter. That would allow the Green Line to run as normal and the 15 to detour at Russell to Bay and route the race by several Bay View restaurants/bars and plenty of through a nice residential area as well for your garden PBR parties. I’d be surprised if they could find a route around the streets of Bay View that isn’t full of pot holes and cracks.